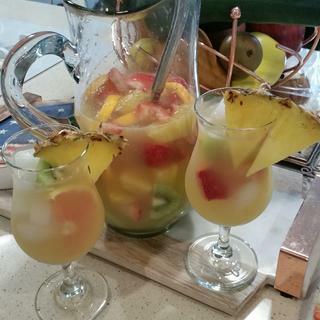 Every party can benefit from a little kiss of Latin flavor using this Libbey sangria set! With this sangria pitcher and six stemmed, curved glasses you’ve got the perfect tools for serving up your crowd-pleasing concoction. You’ll love the solid feel of the sturdy glass pitcher and your friends and guests will appreciate the convenient elegance of the whole set. Take your next party South of the Border in style with the unique utility of this sangria pitcher and glasses from Libbey! Found this online, shipped very quickly, great product. The Sangria is so good but the pitcher and glasses make it??? ?